THERE WAS SHOUTING, crying, and scenes of joy in the courtroom in Mauritius today as the jury gave its verdict at 6.20pm local time, 51 days after the trial of the two men accused of killing Michaela McAreavey began. Avinash Treebhoowon and Sandip Moneea were both acquitted in a unanimous verdict by the jury. However if the verdict relieved the families of the accused men, it left the family of the 27-year-old teacher without an answer as to who committed the crime. John Mc Areavey, Michaela’s husband, and members of his family immediately left the courtroom after the verdict. Outside the courtroom Sandeep Moonea praised his lawyer Rama Valayden. “The truth has triumphed. I thank my lawyer Rama Valayden. Lord Rama (Hindu god) has come to save me in the form of my counsel”, were the first words from the former floor supervisor. Avinash Treebhoowon was also emotional outside the courtroom. “I thank my parents, my wife and lawyers. I suffered a lot. I was brutalised by police. I was beaten so much. Police abused me. But God is great”, he said, almost in tears. His wife Reshma was equally shaken. She had been sitting silently all through the trial, often trying to exchange a glance with her husband. Now she could not contain her emotions. “I’m so happy, my husband is free. Divine truth has triumph. I wish to thank our counsels, Sanjeev Teeluckdharry and Ravi Rutnah. I hope that now the police will do their work correctly,” she said. The mother of Avinash Treebhoowon criticised the police and blamed the officers for having used violence against her son. Defence lawyer Sanjeev Teeluckharry expressed his relief and faith in justice. “I’m happy but yet I once again cannot help myself to feel grief for the Mc Areavey family. As I’ve said before, due the incompetence of the police, the real culprit is still at large”. He added: “It is high time the MCIT is dismantled. We cannot carry on with this amateur approach”. This view was vehemently contested by Ranjeet Jokhoo, the second in command of the MCIT. “We respect the verdict,” he said. “We have to learn from this judgment as from others. We feel we have done the job as we should have. We leave it to the court, the judge and the jury to appreciate our work”. Asked to react to counsel Valayden’s remarks that the police has failed and that the case was marked by police blunders, Jokhoo said that he “did not find this in the court’s judgment”. “Our investigation is same as in other countries. As for methods, this is another issue,” he said. The Director of Public Prosecution, Satyajit Boolell, said he did not believe it was the time to “point fingers at whoever”. ”We need to do everything for justice and for the McAreavey family. I respect the verdict of the jury,” he said. “We will have to explore more to find justice”. Asked if he will appeal the verdict, Boolell said he don’t think that will happen. “We could have challenged the sentence but in this case the verdict is without appeal”. We live with modern technology and cannot rely on confession. We must reinforce independent proofs and scientific help to our work. We must also film confessions so that alleged police brutality is not an excuse for accused parties to get through. 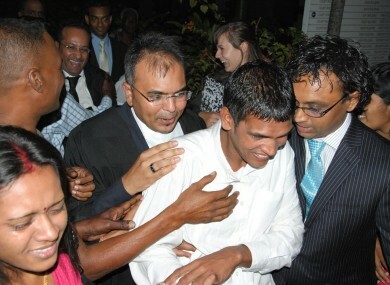 Avinash Treebhoowon and Sandip Moneea were released after the verdict. Treebhoowon went to the office of his lawyer, Sanjeev Teeluckdharry after his release, while Moneea headed to the office of his lawyer, Rama Valayden. For the first time since the 11 January 2011, they will spend the night among their relatives. Avinash Treebhoowon was married for just three months when he was arrested and Sandip Moneea had gotten engaged 35 days before. Both men had proclaimed their innocence in the murder of Michaela McAreavey, who was found dead in her hotel room on 10 January 2011. An autopsy revealed that she had been strangled. Treebhoowon had reportedly confessed to the murder two days afterwards. However during his testimony in court he said that he had been the victim of police brutality and that his confession had been extracted through beatings. The trial, presided by Judge Fekna Prithviraj, opened on May 22 and ran for almost two months. Email “"The truth has triumphed" - accused respond to Michaela verdict”. Feedback on “"The truth has triumphed" - accused respond to Michaela verdict”.